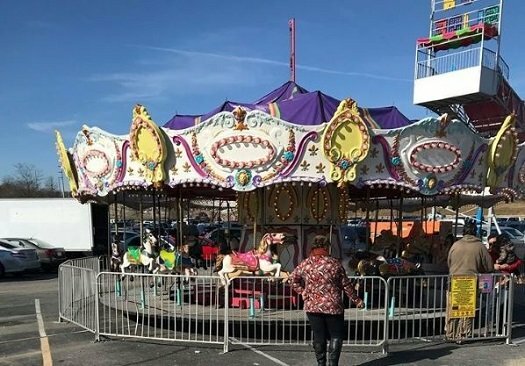 Carousel Rental Merry Go Round rental for events, corporate events, company picnics, motion picture film industry, and weddings. Our amusement rides used at festivals, street fairs, county fairs, parties, birthday parties, anniversary parties, and more. Carosel Carnival Ride Rentals are delivered by BluegrassRides.com. Our event rental services team will work hard to make your event special. We deliver to your location, set up and operate for your event. We take all the worry away if you need to rent carnival rides we have the largest inventory of the hottest amusement ride rentals in the industry. This ride features 24 horses. The carousel is a traditional ride that is very popular among all ages young and old. (1) 220 volt 50 amp circuit requires a generator and transportation.